Author Simon Lewis in Beijing, 15-years after he started researching for Rough Guide to China, a travel book helping visitors navigate both the simple and complicated paths of China. Before the first Rough Guide to China was published in 1996, tourist manuals conformed to the Chinese adage: "Visit the temples during day, go to sleep at night." But Simon Lewis, one of the three authors commissioned to research and write the first edition, did not buy the idea that tourists came to China only to have a look at mountains, palaces and the Great Wall. 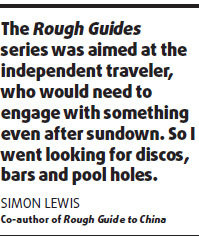 "The Rough Guides series was aimed at the independent traveler, who would need to engage with something even after sundown," says Lewis. "So I went looking for discos, bars and pool holes." In Beijing, in 1995, bars did not proliferate around Sanlitun and Houhai. They had to be sought out. "For instance, the stars of Chinese music bands played at the Scream Club at Wudaoku," he says, but the information had not traveled to the people who cared for it. Lewis spent a year traveling extensively in Dongbei, Beijing, Shandong and Shanxi - the middle provinces of the Middle Kingdom - sleeping in police barracks and abandoned military bunkers, at times. He was on a tight budget and spoke little Chinese. One of his strategies of connecting with people was to join in a game of mahjong or cards, played on the roadside, sliding in, inconspicuously. "Nowadays, of course, it would work only up to a point," notes Lewis. The younger generation doesn't play cards in the park any more. They are perpetually hooked on the Internet. At the end of a year, the material collected was humongous. Writing it up was as stressful as whittling it down to a size that would fit between two covers of the standard, easy-to-pack demy octavo format, without missing out on the essential details. The landscape and travel-related logistics have since been changing at rocket speed in China. The guidebook requires a thorough updating at regular intervals. Lewis has been returning to the Chinese mainland every two years to touch up and add to the first edition, and it seems it will take a while before the sheen of novelty wrapped around this country - that keeps getting replenished - wears off. The most momentous change in Beijing, he says, is the disappearance of the hutong - the labyrinthine alleyways in between the gray brick walls of courtyard houses. Traffic then, says Lewis, "was ramshackle and slow, bicycles dominated the roads now it's shiny buildings and cars." "Cheap hotel rooms had a red carpet with cigarette burns, a spittoon and a flask the better hotels had a red carpet that was, with luck, whole. All Chinese hotels were more or less the same. It was pointless trying to review them," says the seasoned travel-writer. The fast-track growth and high standards of professionalism in China's hospitality industry today amazes him. "They have an understanding of what people want." Tibet remains his perennial favorite. "It's hyper-real. The light there is most amazing, and the sky incredibly blue. Every range in your line of vision is in perfect focus." Yunnan, in China's extreme southwest, continues to amaze because of its diversity of culture and landscape. "There's mountains, forests and such a profusion of the ethnic minorities, all 25 of them, each with a different culture, language, cuisine and housing style." He remembers staying with a Mosuo family once, and got to watch the ways of a matriarchal society in which little girls are sent to school and little boys play all day. Borders fascinate him. On his first visit to the rather wild terrain of the Changbai Mountains, in Jilin province, on China's border with the Democratic People's Republic of Korea, people thought he was looking for the much sought-after gingseng herb. Borders, says Lewis, are fraught with possibilities. "Wherever cultures clash and connect and there's a hint of the illicit, a little bit more is possible. Each new visit - each renewal of his sustained relationship with China - is marked by doing or looking for something that's still undiscovered. Relatively, at least. That's pretty much his belief for rewriting the Rough Guide book: pointing people to what's "less obvious". For instance, if he were told to write about Xi'an today, he would probably recommend Yan'an, to its north. He remembers the happy discovery on his maiden visit, riding a steam train to a "small, grimy town" and landing up at the cave houses where Chairman Mao Zedong and his followers camped as revolutionaries on the run before the founding of the Republic. The spectacular rice terraces of Yuanyang, which were almost unknown and virginal during his first visit almost 15 years ago, have become a regular tourist spot with busloads of visitors unleashed on its gorgeous sun-drenched steps every morning. "If you feel it's got a bit too crowded, you could always take a bus to the next village," suggests Lewis. Domestic architecture appeals more to him than the stupendous, grand and invariably huge Ming (1368-1644) or Qing (1644-1911) dynasty palaces or imperial houses. Domestic living spaces, such as houses on stilts in rainforests, he says, have been better preserved. The original structure of the Great Wall, though repaired and touched up in many places, is still in evidence. "The stretch between Jinshanling and Simatai is largely unreconstructed," he says. The best way to do the Wall, of course, is by taking a walk along its ramparts. "That's how one gets a real sense of what it meant. The people who built it, unfailingly, chose to do so on the most difficult and inaccessible part of the terrain. The best way to feel it is by walking from ridge to ridge," says Lewis, in understated admiration of the contrapuntal rise and fall of a structure built primarily as a line of defense. 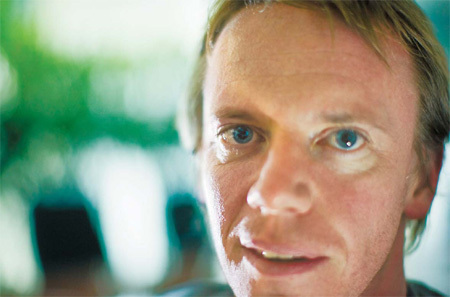 His two novels, Go and Bad Traffic, are inspired by his experiences as a travel writer. The second, published by Sort of Books in the UK last year, was highly commended by mainstream papers (The Guardian calling it "an enjoyable culture clash thriller"). The story of Inspector Jian, a Chinese cop from the Siberian border who lands up in England looking for his missing daughter and runs into fellow Chinese, migrant worker Ding Ming, hunted by a deadly gang of snakeheads, is, ultimately about borders and the consequences of crossing them. Niu Jiang on the Sino-Myanmarese border, for instance, signifies something of a "dead end" for Lewis. "These are places where culture, nature and the ethnicities of people are more authentically retained."